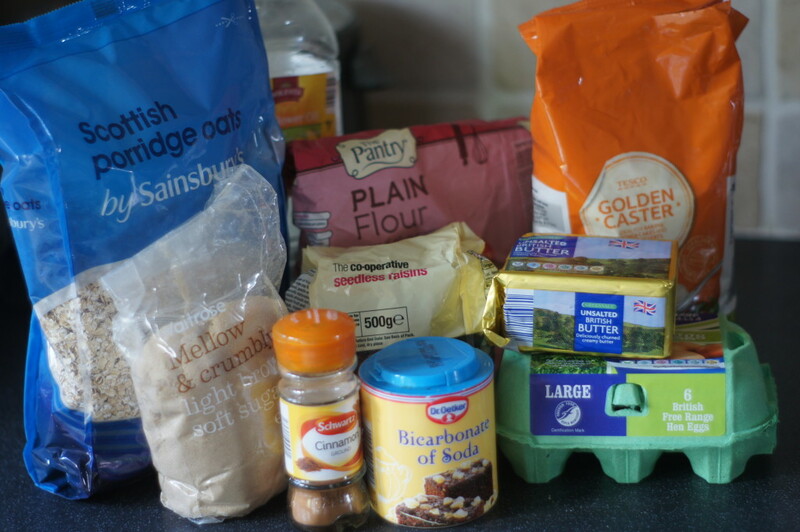 This week bakers around the country rejoiced – The Great British Bake Off is back! If you watched you will know that next week is biscuit week. Inspired by this and today’s terrible weather I decided today was definitely a cookie baking kind of day. I also decided that it’s time to get back to some of my cookbooks. I am forever pinning recipes I have found on the Internet to my Pinterest pages which means I neglect my stack of cookbooks. My usual go to recipe for oat and raisin cookies is this Hummingbird Bakery recipe which produces a soft and chewy cookie which is always well received. I did try these a couple of months ago, as they were dairy free, but didn’t like them as much as the Hummingbird Bakery ones. 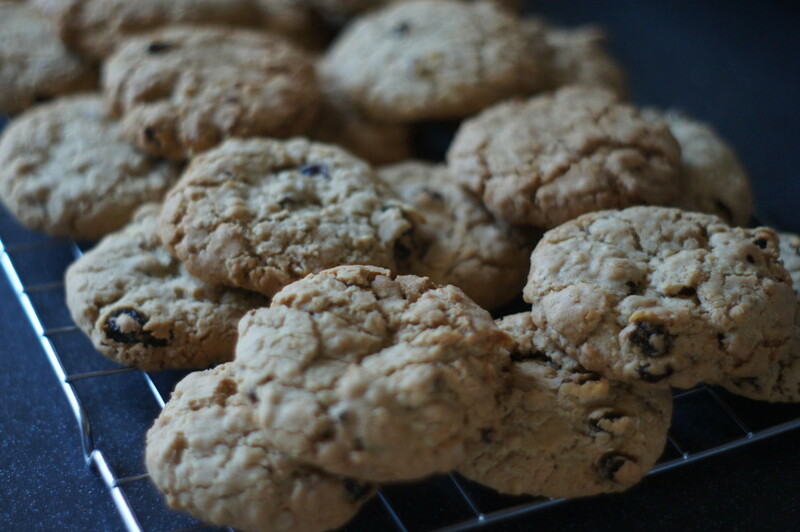 I decided to give this Jo Wheatley recipe from ‘A Passion for Baking’ as it meant I would I would be dusting off one of my cookbooks but I also like to think that an oat and raisin cookie is relatively healthy (if you ignore all the butter and sugar!) I made 22 cookies from this recipe but this will of course depend on how big you make your cookies. 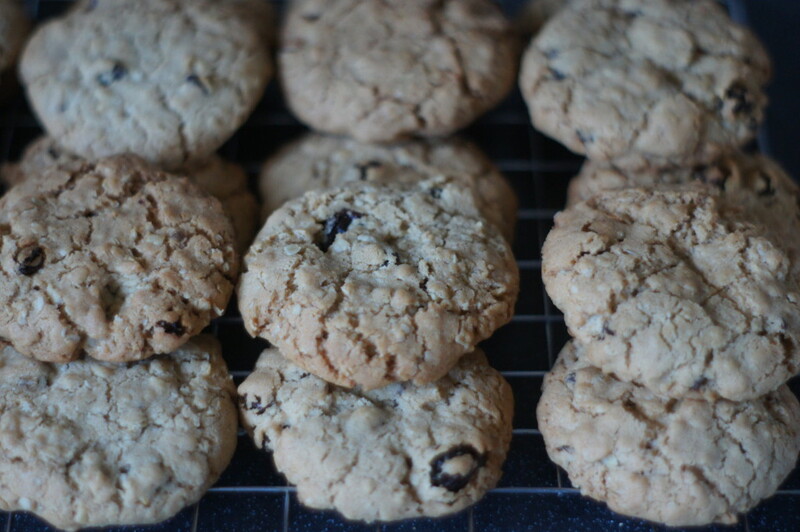 These cookies are crunchy rather than soft and chewy – they have just received the Mr Birdie seal of approval and I have to say I was really pleased with how they turned out. You will need 2-3 baking trays lined with baking parchment. 1) Preheat your oven to 180C/350F/Gas 4. Line your baking trays with baking parchment. 2) In the bowl of a free-standing mixer or in a large bowl using a handheld mixer, cream together the butter and both the sugars until pale and light. Add the egg and oil and mix again. 3) Sift the flour, bicarbonate of soda and cinnamon into the bowl. Add the oats and raisins anf mix again until smooth and thoroughly combined (I used a wooden spoon to bring everything together). 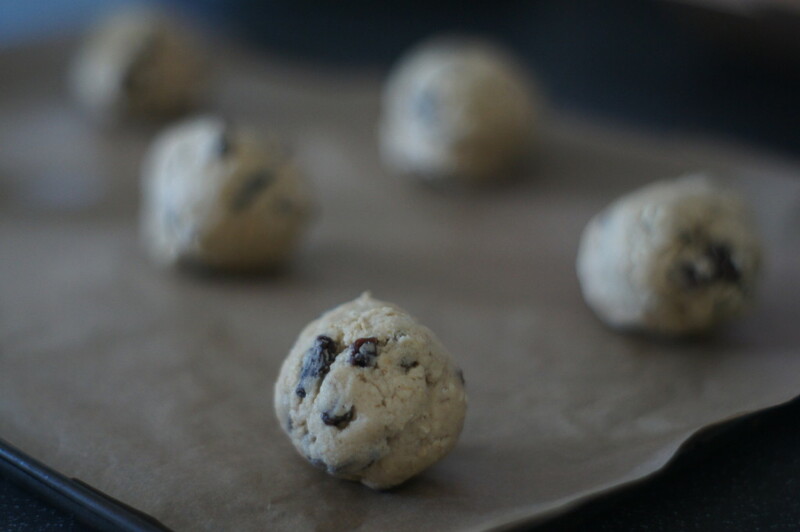 4) Using your hands, roll the cookie dough into walnut-sized balls and place onto your prepared baking trays. (Allow plenty of space as they will spread during baking). 5) Slightly flatten the cookies with the palm of your hand and bake on the middle shelf of the oven for about 20 minutes (I found mine needed a couple of extra minutes on top of this) until pale golden and firm. A real treat – loved the tasty chewy raisins! The cinnamon really came through. Yum!